Last night, the Dow Jones managed to limp to a fifth consecutive positive session but the gains were tiny and other US markets such as the S&P 500 and the Nasdaq closed down on the day. Whilst the closing levels were mildly bearish, the near 1% reversal from the highs of the day sent ripples through Asian markets which has resulted in a return to more cautious trading in this morning early European session with the FTSE, CAC and DAX opening down over 0.5%. Today is a busier day than yesterday with a number of middle tier economic announcements. At 08.30 GMT we have UK mortgage approval levels followed by the latest US house price data at 13.00. Following this at 14.00 we have the all important US consumer confidence figures and MPC member Charlie Bean is due to speak after the London close. Cautious stock market trading has made its way onto the forex market with the dollar and yen building on yesterday’s gains. On balance, Sterling is bearing the brunt of the selling, dropping 0.4% against the dollar and 0.85% against the yen. The GBP has bounced off the 153.50 level three times already this month and it looks to be heading towards this level once again. Could it be fourth time lucky for sterling this time? With oil prices still holding around the $70 level, there are indications that the bulls aren’t done yet, which could be good news for the GBP/JPY. 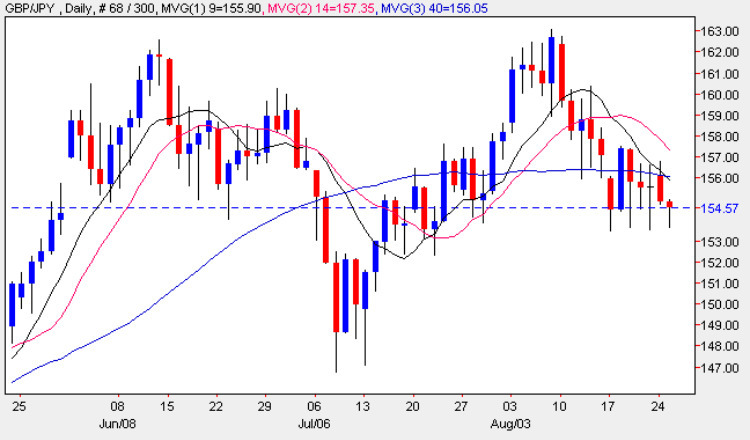 If the pair hits the 153.50 level once again, a double (up) trade could be the best way to play it.